It was a relatively smooth trip. Flights were on time and everything was straightforward. The food was great and the wine was free. I will admit that I was surprised at how put together everything seemed. This was my first time on an African airline, and boy had I heard some stories! 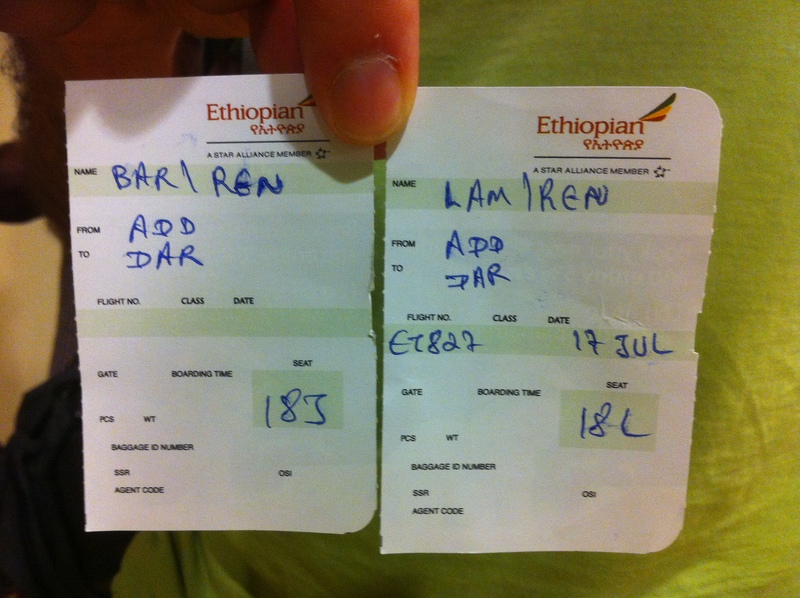 Then we arrived in Addis. We had a layover before the second leg of our flight, and even though we had not been given our boarding passes for this leg initially, we were quite assured that it was non-issue and everything would go smoothly and be straightforward once we arrived in Addis Ababa. I should have known as soon as we got off the plane that we were in for an experience. Hurdle number one: how to get up the escalator and into the terminal. I didn’t anticipate this being a problem, but I blame that on my own ignorance. As we disembarked from the bus taking us to the terminal this challenge became quickly apparent. Everyone was huddled around the bottom of the escalator, mostly just looking at it. There seemed to be confusion as to how to approach it. Some took a breath, held their bags tight, and jumped on, teetering precariously back and forth as they tried to catch their balance. Others ran onto it apparently trying to match their starting velocity with the speed of the escalator. But most just stood at the bottom gently putting one foot on and then off until they seemed confident that the thing would not throw them across the room or, even worse, swallow them alive. Hurdle number two: How to find your gate when there are no signs or gate numbers. We had done this before, and amazingly it always worked out, so we ventured past security full of confidence that we would have no problems finding our plane. Our confidence was a little misplaced as no one had a clue where we should go. We were directed here and then there, and finally to the one gate with people at it. We scurried in, got our boarding passes from the agent at the gate, and stood to the side waiting for the boarding call. Boy did we luck out because boarding started right after we got in. Hurdle number three: How to drive a bus. We headed down the stairs (avoiding the escalator to our left) and out onto the tarmac to wait for our bus, which came, but then decided to leave. It pulled in and then, after a few minutes wait but with no passengers, it reversed smack into a second bus parked right behind it. Mirrors went through windows and glass was everywhere. Thankfully this did not present a problem to the drivers who both proceeded to pull up and fill up with passengers. The wind rushing through the broken window was a saving grace as the driver seemed to be a 14-year-old kid who somehow mistook the airport tarmac for a Formula One track. Swerving and jogging, we miraculously arrived with no incidents, until the driver realized he had the wrong plane. This time he pulled forward instead of reversing and swung around to another plane. Also not the right place. Cell phones came out. Lights were flashed. Plane number three, nope, not there yet. Hand signals, mid tarmac conversations, and another 15 minutes down and we were there, back at the first plane, which had by now opened it doors as a sign it was ready for the busload of tousled, bus sick passengers. Hurdle number four: You’re going where? Off the bus and onto the plane. I pushed my way towards the front, certain that if I failed and boarded towards the end, we’d have an inevitable hassle trying to remove the person that would be sure to sit in our seats, seeing as two open seats provides much more elbow room than a middle seat someplace else. My boarding pass was checked for the third time in my adventure by the flight stewardess, and I scurried on. I had already thrown my bag under the chair and sat down when I realized I had lost my husband somewhere in the fray. He had been caught in the front, held hostage by the crew when they realized that his boarding pass had a different destination than their intended landing spot. But this is the right boarding time and we were at the right gate? “Yes, yes.” But we had our boarding passes checked twice before getting off the bus and onto the plane. “Yes, yes.” But we were still on the wrong plane, without a way back to the terminal (our broken bus already long gone back across the race track), and with only 15 minutes to spare before our own flight left us in Addis overnight. Hurdle number five: How to make our departing flight while stuck on another plane? Alas in Africa, no hurdle is insurmountable, especially if that hurdle is punctuality. Our plane was delayed and within a half hour we were back in the terminal, back at the same gate, back with the gate agent checking our boarding pass for the second time. “Are you sure this is the right flight this time?” “Yes, yes.” Down the stairs (still avoiding the escalator to our left) and again out onto the tarmac to wait for our bus. “Are you sure this bus is going to the right flight this time?” “Yes, yes.” Onto the bus, this one with all windows intact. Out again and up the stairs (still pushing my way to the front of the line). This was very entertaining. Sounds like here in Kathmandu when at the final gate. Just keep asking……..
Kathmandu was a good prep – no doubt!